Mention that you're looking at a motorhome and most non-RVers think of a Class A -- the bus-style coach built on a specially designed commercial chassis. Yet the reality is that the majority of motorhomes sold every year are Class C's, which are built on an automotive van or truck frame, with the motorhome body appended to the original cab. 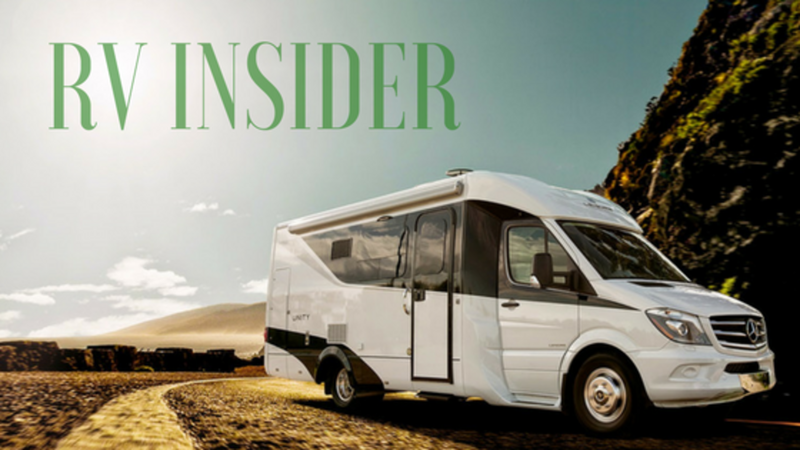 According to Niles Whitehouse, Product Manager at Winnebago, there are some very good reasons these motorhomes are so popular. "For one thing, many people are more comfortable driving a Class C coach, because the experience is similar to driving a large pickup. In addition, Class C coaches are typically more economical to buy and to operate, as they tend to be more fuel-efficient. 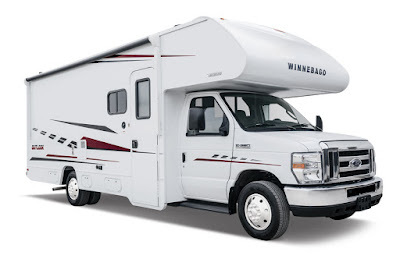 "And because they're smaller than a Class A, they're easier to maneuver in campgrounds and can go some places you might not want to tackle in a Class A motorhome," Whitehouse noted. When it comes to floorplans, modern Class C's make the most of available space. Most have a sleeping space over the cab; that bed, coupled with a bed in the rear, plus a sofa or dinette that converts to another bed, means that a Class C coach will often have more sleeping capacity than a typical Class A, so it's no wonder Class C's are popular with families. Many C's have slideouts that add to the living space. For example, Winnebago's Outlook 27D floorplan has two slideouts, allowing Winnebago to put both a walkaround queen bed and a roomy bathroom in a 28'8" long coach. 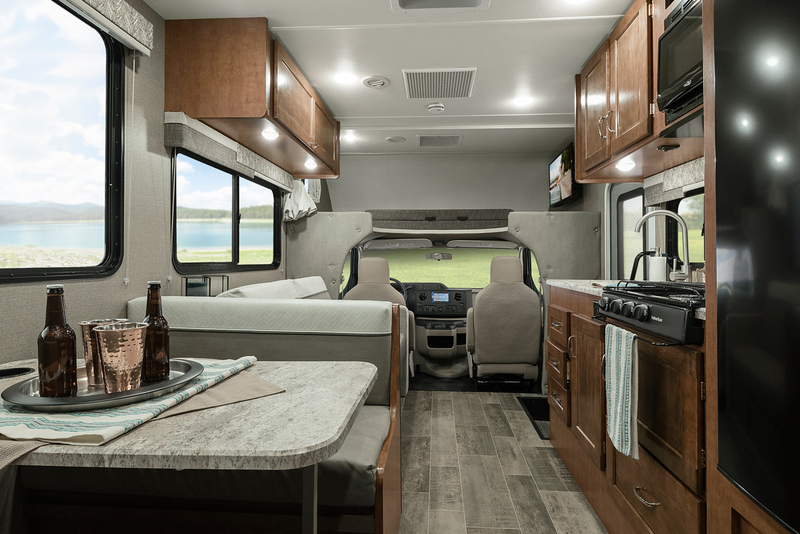 The Outlook, introduced last year and debuting dynamic new exterior graphics this year, represents a new approach for Winnebago. "Our 'voice of the customer' research told us what most people wanted in a C, and we pretty much took everything on that wish list and made it standard. That really simplified production for us, and allowed us to bring the Outlook in at a lower price point," Whitehouse explained. "They're fully equipped, right out the door," said Whitehouse. When it comes to choosing the right Class C for your family, choosing the floorplan is important -- but so is the build quality. Looking at things like fit and finish can tell you a lot. Do the drawers glide smoothly? Do the doors close solidly? Is that bead of caulk being used to hide sloppy workmanship? Also, consider the quality of the 'support systems' -- things like the plumbing and electrical systems. Is the generator the right size for the coach? How about the holding tanks? Does it include or is it pre-wired for solar power? Finally, consider the things you can't see: how solid is the framework around the coach? How solid is the warranty? And how solid is the company that's standing behind the warranty? 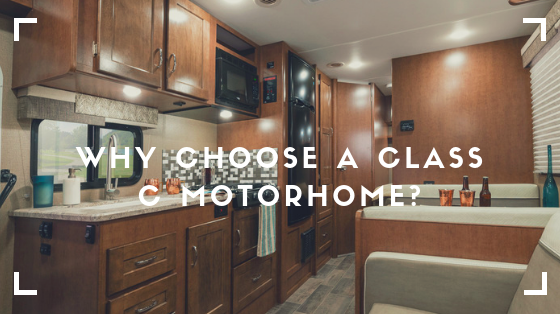 The answers to those questions will help you find the perfect Class C motorhome. Happy hunting! Learn more about the Winnebago Outlook here.